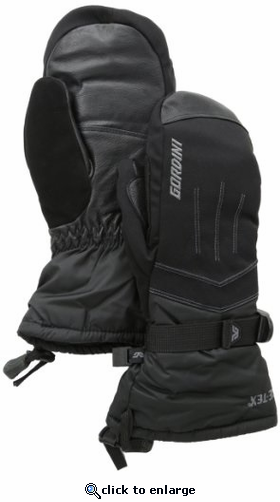 Stay warm on your next outdoor winter adventure with help from Gordini`s Women`s GTX Down Mitten. This Gore-Tex gloves is guaranteed to keep you dry with help from it`s waterproof inserts. Gore-Tex: Gore-Tex provides maximum comfort over an extremely wide range of temperatures and activities due to a high level of breathability. A Gore-Tex membrane is fixed between the outer shell and insulation to produce a windproof, waterproof glove that can keep hands drier and warmer for more extended periods than traditional waterproof breathable barriers. Shell: Breathe weave stretch woven fabric with Select Flex trim. Genuine goatskin palm and thumb reinforcement with goatskin finger area, wrap cap, and index finger and thumb reinforcement. Insulation: Naturaloft insulation package: 600 fill power of 70% goose down 30% waterfowl feathers all around the hand, Hydrowick microdenier lining with thermo-plush in the cuff, Gore-Tex Guaranteed to Keep You Dry, waterproof, windproof, breathable insert. Features: Naturaloft, Gore-Tex, Gauntlet cinch closure and pre-curved construction, nose wipe, wrap cap, palm and thumb reinforcement.